It fits perfectly, and is a wool blend, so it will be good for these Winter/Spring days we've been having, and the colour means I will be easily seen by drivers, other pedestrians, and just about anyone within a radius of about 5 miles. I hope I'm not mistaken for a traffic cone. 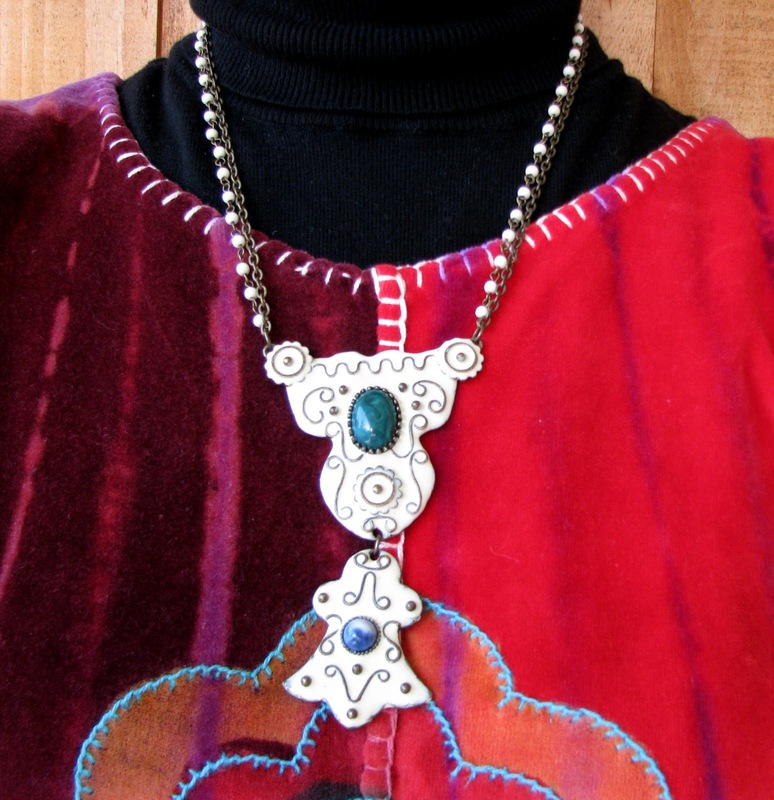 In addition to thrifted joy, I was also gifted with a parcel from the divine maxi-dress queen herself, Curtise, which contained, amongst other treats, this lovely painted metal necklace, which I immediately put on with the thrifted velvet top I was wearing that day. I was honoured to be the recipient of two items of clothing that I had admired her wearing on her blog, which I will show you when they are incorporated into an outfit. The thrill that comes with receiving packages of joy from other bloggers - priceless! 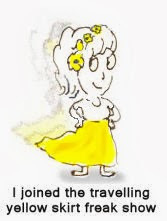 This is my last post for the week as I am heading off on a secret blogger adventure from which I will report back next week. Y'all have a good week now, y'hear? Amazing coat! I love that color, and it's got a great shape. That necklace could not be more perfect with that top!! Serendipity! What a fabulous coat! 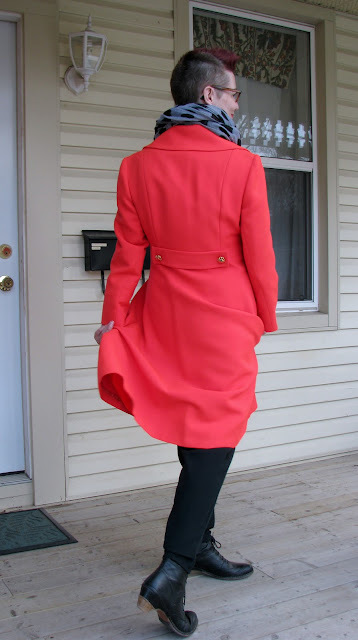 I love the colour - I am always boggled that coats are black, making them nearly invisible in the twilight or dark. Shellery, I love the cut, colour and detailing on that coat - what a pop of spring too! The necklace Curtise sent is too dear. Looking forward to seeing the other goodies. And a secret blogger mission? Sounds intriguing! Wow, the coat is beautiful. Very cool necklace, too!!! That coat looks incredible! Definitely the most unique colour I've seen. Shelley, that coat couldn't fit you any better if it had been tailor-made for you! I love the is-it-pink-orange-peach? neon colour, and the beautiful shape and style. Traffic cone? I don't think so! Traffic-stopping? Yes indeed! Oh YES, that coat is AMAZING! Divine colour - exquisite fit - and you look AMAZING in her, Shelley! I can't wait to hear about your fabulous top secret blogger adventures!! That coat is fabularse, darling! it fits like a dream and the price was amazing! Love that pendant, soooo groovy! WOW! I love the coat. What a beautiful color and I love the gold hardware and the fact that it's a bit 'structured'... I can't believe you got it for that price. Stunning! That coral coat is amazeballs! And it fits you to a tee! 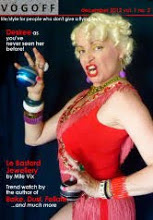 How wonderful bloggerland is- what marvelous gifts- and how perfect that necklace is for you. Can't wait to see what other goodies Curtise got for you- she has such a great eye for vintage finds! And secret bloggy meet ups? Intrigued! 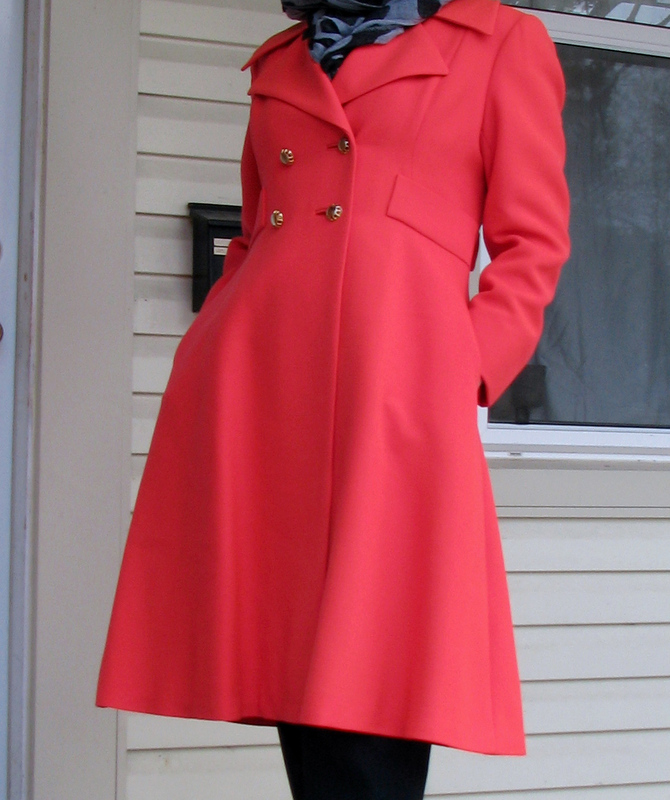 Bright coral/red coat? DO WANT! 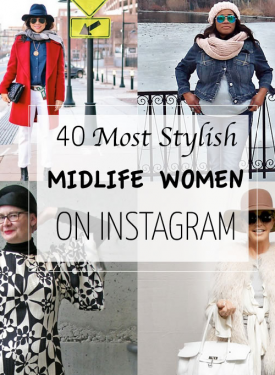 You look amazing in that coat, which seems like a fun departure from your usual style, which I also love. The necklace is totally cool, too. Can't wait to see what you're up to!! 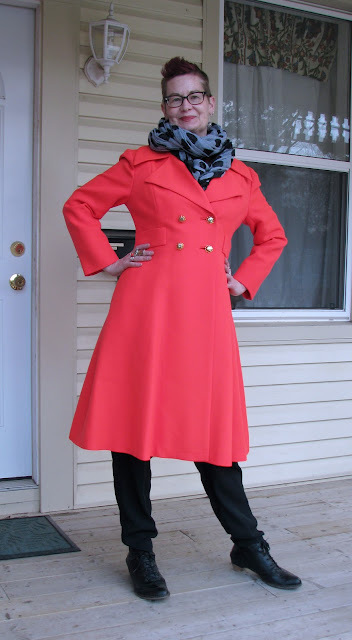 that coat is just fabulous, love the color, love the shape and love that you're going to wear it with your great style! !, you look gorgeous! It was great to meet you during your trip to YOU KNOW WHERE. Can't wait for your post on YOU KNOW WHAT! Sure hope your trek from the north country was worth the fun - and the haul! I love the coat! Such a stunning color, and looks so good on you! What a fabulous, stunning coat!! The color is just so cheerful and joyous!!! Wow - incredible coat! Its dayglow warmth and loveliness is a beacon of style. The cut is perfect on you.